I found an excellent video on Blockchain introduction. The speaker described the basic blocks and cycle of the Blockchain in a very simple, but powerful manner. I have seen other videos too, but this one is the BEST. If you are also witnessing the hype of Blockchain and still unclear that what exactly it is,, do watch .. I was following the ‘Data Science with Microsoft SQL Server 2016’ ebook and the first step was to configure the R services. To resolve this, you need to launch the SQL Server 2016 Configuration Manager, you will notice that the ‘SQL Server Launchpad’ service is stopped, you need to start this. Once you start this service, the SQL Server will allow you to run the R script. I found this wonderful link, compiled 10 useful Github IPython notebook tutorial for leanring data science and machine learning. They all are based on Python, but general concepts are transferable. Microsoft has made available some excellent R sample that you can download and explore. You can download it from GitHub. All of them provides machine learning template that you can run through SQL Server 2016 R.
Predictive Maintenance. Predict machine failures. Customer Churn Prediction. Predict when a customer churn happens. Online Purchase Fraud Detection. Predict if an online purchase transactions is fraudulent. Energy Demand Forecasting. Forecast electricity demand of multiple regions. Retail Forecasting Forecast the product sales for a retail store. Campaign Management Predict when and how to contact potential customers. An excellent quote. Though in most of the sites, they mentioned ‘Charles Darwin’, but actually its not his quote. I’ve finally decided to resume blogging after 3 years. Its never too late. Lots of things happened in last three years, in fact a lot of share. Last time, i used to blog, when i was in Qatar, I moved to UAE after that and now relocated back to Pakistan recently. I’ll hope that from onwards now, I’ll be active. Bye for now, will catch up you soon. Yammer is one of the renown social networking platform. Microsoft has acquire Yammer recently and want it to be part of SharePoint social networking. You can easily sign up (even free edition) at Yammer, and can start using it. At present yammer is only available online. Its not like a service which can be hosted on premises SharePoint. Today Microsoft has announced the complete roadmap of Yammer & SharePoint integration including online/ cloud/ office 365 and on premises, which was awaited by the community. The good news is that it will be available to the SharePoint server 2013 soon. The new Windows 8 release is not only a major release with respect to IT PRO, but for the developers as well. The new Windows APP development will be an exciting concept for the developers now. The same phenomena go SharePoint 2013 now. In SharePoint 2013, Microsoft has introduced marketplace concept, in which now developers can market their apps as well. 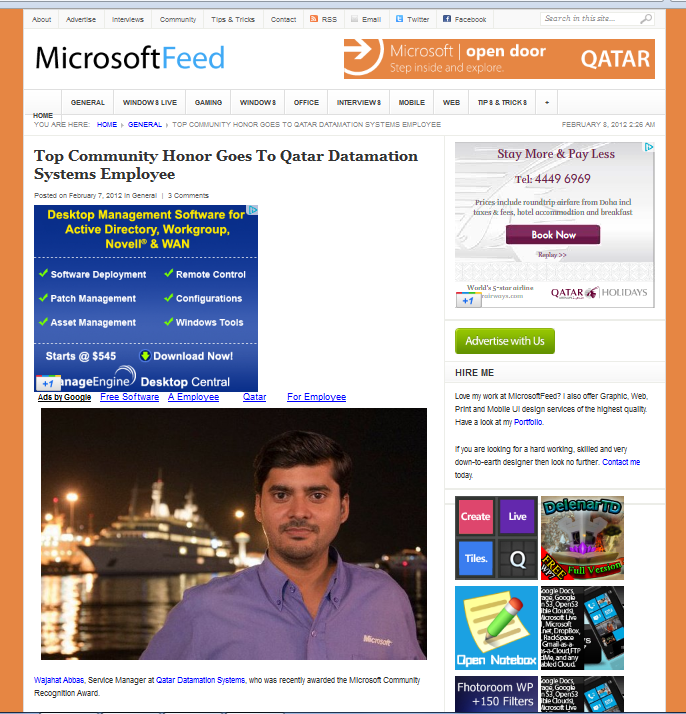 Last week, Michael Mansour who is the regional director at Microsoft UAE traveled to Qatar. He want to meet development partners who can work on the new windows 8 app development. As Qatar is a growing market, but its hard to find good development partners here. I was approached by Sara Abbas, who works in Microsoft Qatar. She was referred by KalSoft team during GITEX. KalSoft is one of the leading Microsoft partner in the region, and works with Qatar Datamation system in Qatar for Microsoft services project. Michael Mansour & Sara had a meeting with us and they share the initial plans for the windows 8 app development. They also shown few of the applications that their team developed on App. Microsoft team also agreed to provide us the resources to develop us for the new competency. We hope that the new app development will able to create a good market. No doubt that Microsoft come out with lot of exciting thins like Surface, new app model and much more. Gitex is one of the best ICT exibition in this region. This year, i had the privilege to conduct a session during GITEX 2012 on SharePoint 2013. Our company KalSoft had a booth in the Microsoft Pavalion. KalSoft is one of the best company when it comes to consulting services on Microsoft server products especially SharePoint, EPM, etc. 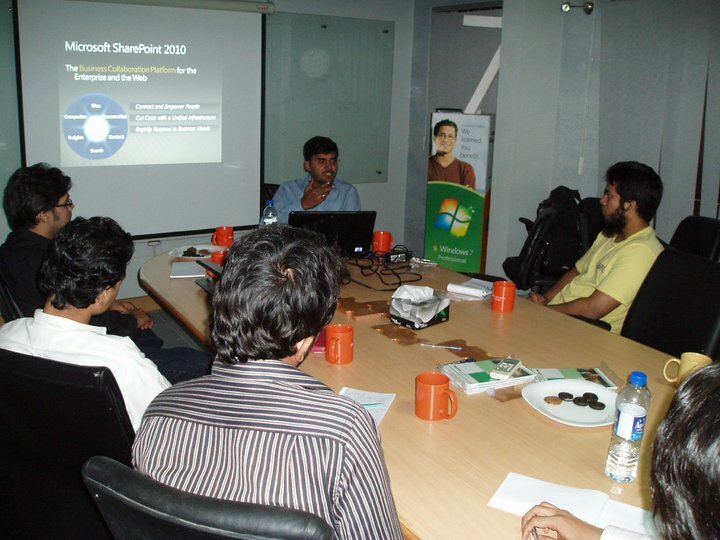 I conducted the session on SharePoint 2013, the upcoming release of SharePoint. During the session had a chance to talk with the customers with their requirements, and especially with respect to the upcoming release. Overall customers, partners are much excited with the new release. Also would like to thanks Ovais Kaizar, who played an important role on KalSoft booth & special thanks to Farhan & Faizan Balooch who traveled from Oman to organize this all. It was really great to attend DTAC Qatar yesterday on May 11, 2012 at Qatar Convention Center. When i register for the DTAC almost month ago, i was thinking that what we gonna do with this whole day program starting from 6:30 in morning and to be conclude by 9 at night. As i am new to toastmaster and this is my first experience to attend such conference. I was really wondering. And then the good thing, that i was accompany by Mr. Arshad Siddiqui who worked as an Architect in Nespak Qatar. So he picked me and then we go together and arrived there at 6:45 at convention center. Qatar Convention center is huge building. After parking it took around 15 minutes to reach the SPIDER where registration was going on. We already had register but didn’t pay so did the payment. The young gaveliers were quite helpful. Then we had breakfast, and then we had the banner parade. I also participated in the banner parade, and join the PTM president in holding the PTM banner. The first contest was then of humorous speech. It was an excellent experience. It was full of fun and laughter. Then the 2nd session was of Table topic, and the topic was “What event from your past, present or future, you would like to attend in person” That was also very well taken by the contestant. Falcon Award was then chaired by Mr. Nisar Rana. It was a good session overall. After then there was a comedy show being played a Qatari comedian artist Mohammad. It was a wonderful show. And then after the launch break there was evaluation contest, in which Mr. Arshad Zaidi delivered a good speech on “Who move my cheese”. He got some wonderful feedback by the contestant. And finally the contest of International speech. All the participants were great. They delivered thought provoking speeches. It was excellent learning. After that there were speeches from honorable guest, among them the notable speech was delivered by Indian Ambassador to Qatar. Her speech was full of thoughts, and she briefed that how communication has played a vital role in bringing change to masses. She highlight a program of All India radio “Tan Tan sukh” little little efforts for betterment that bring changes to life of common man, and how it change a village life, and then she also highlighted Aamir Khan recent tv show “Satyamev Jayate”. And then the emotional movement, that was the results announcements. Nisha Shivram topped the contestants winning two of the four categories namely Evaluation Speech contest and the coveted International Speech competition. The other winners of the speech competition were Tesu Thomas (Humorous) and Abishek Chattopadhyay (Table Topics). And with this we finally rush back to our home. Overall it was wonderful day, i may missed lot of names and sessions to mention, but it was a worthwhile experience, and i congrats Division E Governor Krishna Kumar and his team for arranging such great event at large scale. But as a toastmaster we learn to improve ourselves. And so as we have evaluation session. So there is just one suggestion which i want to give to the team, and that is about the venue. Although there is no doubt that convention center is among the best place to arrange big conference but i personally feel that if it has been arrange in some hotel and we had some roundtable kind of arrange like it was in IBQ at Ramada. It must be more comfortable for participant to sit easily, because it was a full day session. So it was little bit uncomfortable for participant to sit on such place for long session, and hard to socialize as well. 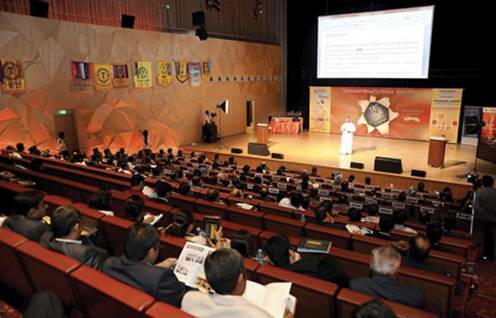 Besides, it was an wonderful event and heartiest congratulations to the organizing team and all toastmasters of Qatar. While restoring one SharePoint intranet site, i realized that there were some WSP required for the intranet restore. So i want the WSP files to deploy the portal, but i cant able to find the WSP file. I browse the system, and saw that the WSP was uploaded & deployed at other SharePoint Server (From where i am backing up). It was deployed on the portal, and can be viewed at Central Administration (SharePoint 2010), but the file was not available on the file system. So i want to download the files from the central administration. While searching internet, i found 2 solutions for this, one is that you can extract the WSP using code, or there is a small piece of powershell commands, which will get you the WSP files, and its quite pretty much simple. So you need to open the Powershell and run the following command in order to get the WSP file. This simple piece of command will get you the WSP File. This was a very good topic that was suggested by one of my friend, and he requested us to arrange a session in his Development house. The audience was pure development technical users. 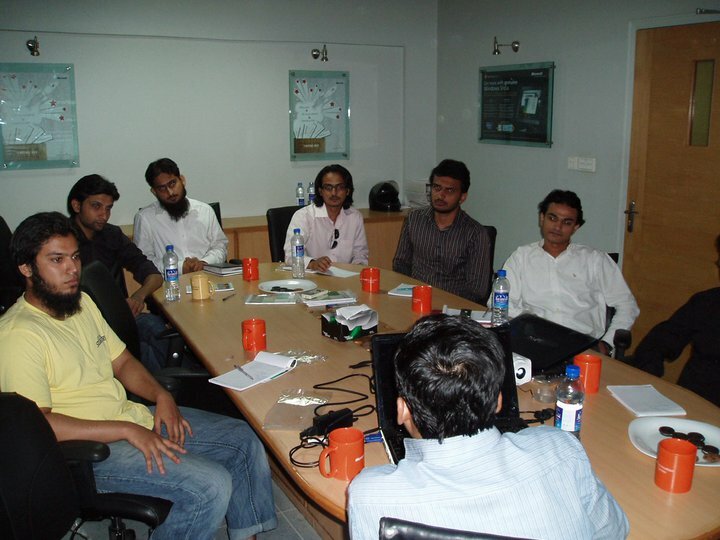 This session was arranged by SharePointGulf. SharePoint, especially after 2010, is a stable development platform. Utilizing SharePoint will be give you extra edge, especially you dont need to consider many things like authentication, user management, document management. As SharePoint provide native .Net technology support, so .Net developers can easily use it as a platform for developing solution. The session was quite informative, and as user were pure technical, so we had a very good discussion. The session was quite interactive, in which users discussed different scenarios about the document management solution over SharePoint. SharePoint 2010 has added lot of good features with respect to document management, and we hope that building document management solution will be comparatively easier in SharePoint now. This event is organized by SharePointGulf (User group). The event provided a good idea about utilizing SharePoint as a platform for building different kind of solution. The program was arranged by the Microsoft Innovation Center. 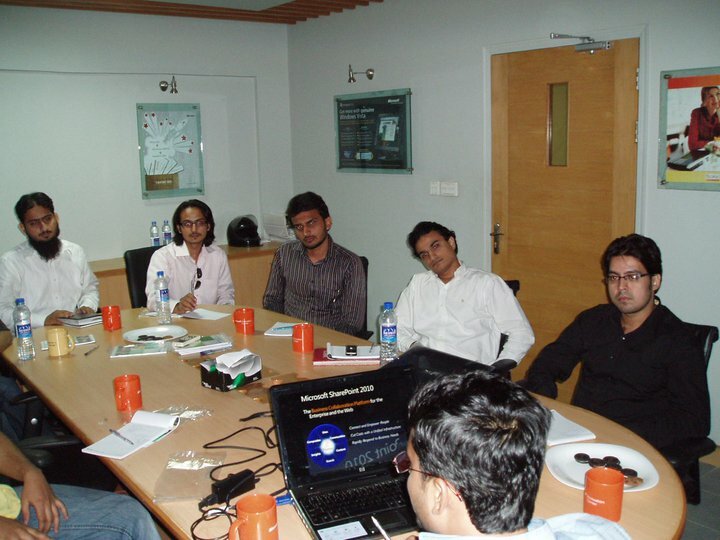 During the event, many participants asked that how they can utilize SharePoint in their final year project. So we shared different ideas on this. The event was quite interactive. The event help understanding students that how to adopt IT Career on Microsoft technologies. 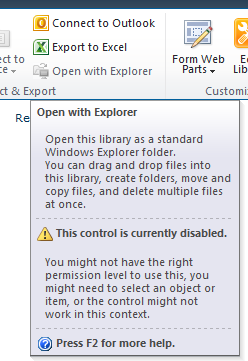 All of a sudden you realized that you cant able to use the open with explorer option with SharePoint document library. Open with explorer means opening the document library in a windows explorer format. This what happens with me today while running a demo at one client at Qatar. This was working before, but today i was not able to open the explorer thing, and even office client integration was not working. There could be couple of reason for it, like some setting required on central administration or some settings as 14 hive folder (control/ templates), but for me it was nothing just the browser 32 bit and 64 bit issue. I opened the 64 bit IE, and tried to open it from there, which doesn’t allow us to open the windows explorer view from the 64 bit browser. 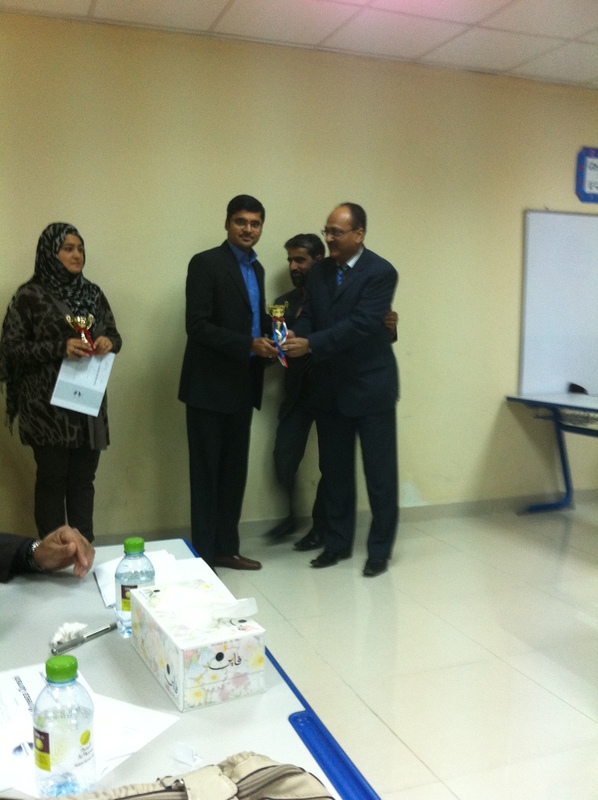 I am excited to share that I won the International Speech category competition of PTM toastmaster club yesterday i.e. March 10, 2012. I am new to the club, joined it 6 months back, able to won this important competition while competing with senior toastmasters. So with this, I will be competing now Area 51 Contest on coming Friday at Pak Shama Auditorium. There will be 5 contestants. At this moment, I want to thanks Mr. Nisar Rana, Mr. Abid Hussani, Mr. Bashir, Mr. Asghar Ali Khan for their continuous support. And would like to special thanks to Mr. Azimuddin who is my mentor at Toastmaster. His continuous support, motivation always help me. He has guided me on the Area contest. With GOD will, if I succeed on the Area Contest level, then will qualify for the Division level which will be of Qatar Division. There were 4 contestants yesterday. Ms. Muniza Qureshi was the runner up, while others 2 were Mr. Arif Qureshi & Mr. Asghar Ali Khan. Wish me good luck for the coming Area Contest. 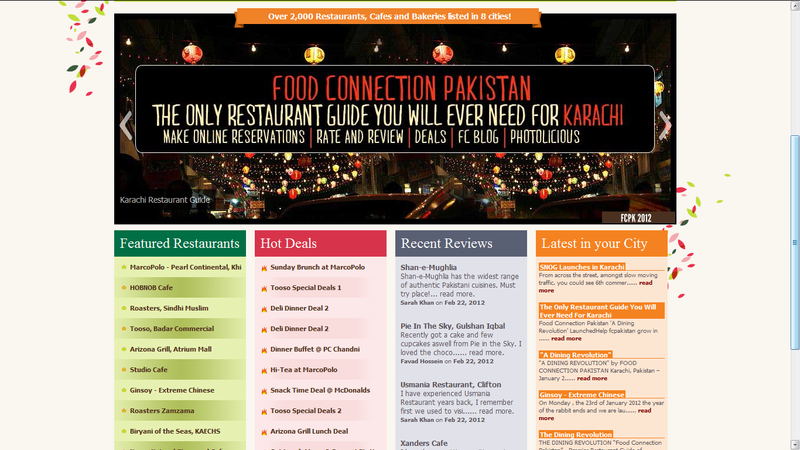 I have been working on SharePoint from 2004, but i came across very few SharePoint Public Internet site like Food Connection Pakistan especially UI Design. The site is too cool, extremely professional design, with extremely good sense of user behavior. And why it shouldn’t be as its developed by Maventor i.e. 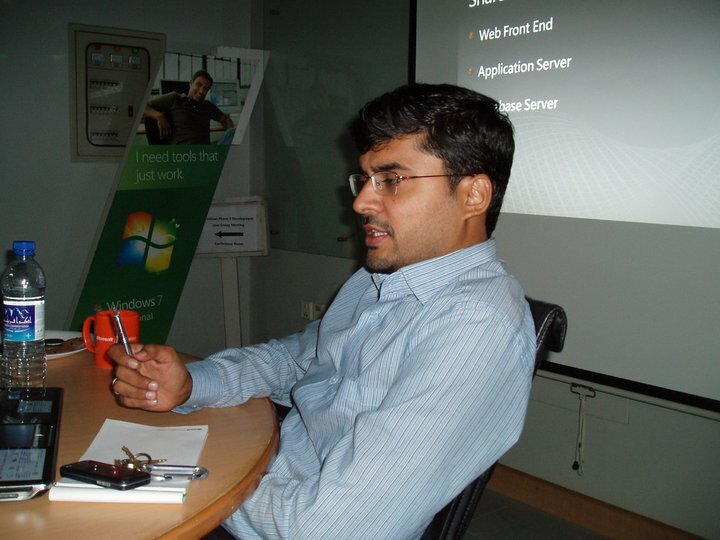 Rai Umair — The SharePoint Master. Thumbs up to FC Pakistan & Rai Umair on such cool piece of art. Few days back, on of my friend contact me for a solution. He has implemented MOSS 2007 with SQL Express. He use his SharePoint site as a repository for uploading/ maintaining all the files, even very large files like of 1 GB. While uploading more than 20 MB he started getting error, so wee increase the file quota from the Central Administration and make it to 2 GB. But the error remain same which was “Request timed out”. Then we increased the request time out from IIS. But still error was there. We were able to upload 300 MB files though, but not able to upload 1 GB file. We just add executionTimeout=”999999″ and then it allow us to upload the 1 GB file even. The problem was with the upload.aspx page execution, which processing timeout expires, so with this it easily allow us to upload files with greater size. Microsoft Gulf has announced a competition on online Microsoft Virtual Academy. They announced this before the Qatar Microsoft Open Door 2012. I also joined the website and passed some exam. 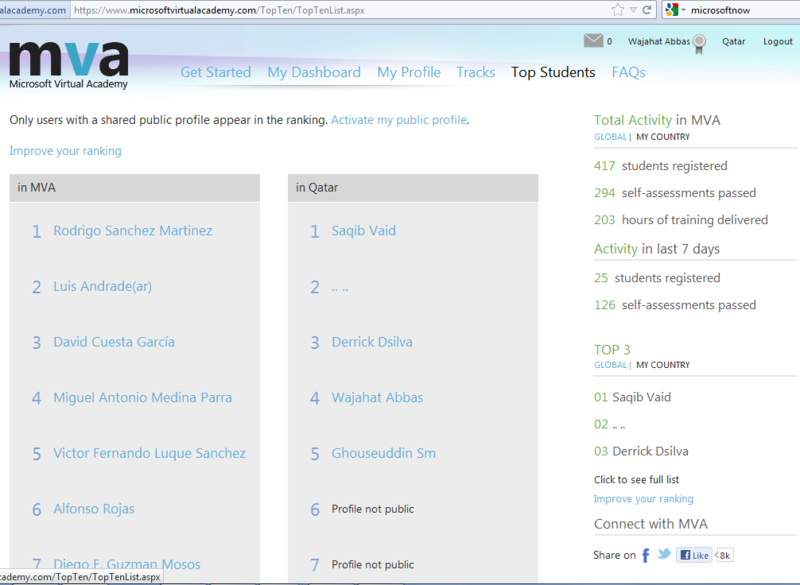 Few days after i received email from Natasha Zaza that i was among the top 5 students in Qatar. At that time i was at 5th position, but after some exam i popped up to 4th position. Microsoft was due to give some gifts for the top position holder but at the spot, we came to know that due to some Government policies they cannot give gift. Anyway it was a nice experience overall. Though its slight old news, but happy to share it, as Microsoft Feed publish it. Thanks Shijaz Abdulla Microsoft Qatar for the tip.